In a sense, this section is really an archive on the early crop circles of southern England. I first saw one whilst sitting with Roland Pargetter on the top of Silbury Hill (Frog Odds' sake please don't tell anyone I did that! ; ) back in 1988 (back then climbing that hill wasn't as much of a no no as it is today). I became very excited about these enigmatic circles/formations for the next decade or so, but I also became convinced that they were not the same energetically as the older sacred spaces like the magnificent Neolithic ones in the vicinity of Silbury Hill (read: The Avebury Megalithic Complex), so my interest wained. They're lovely, and a true mystery, but my focus now is elsewhere. Many of the crop circles in Britain in the past twenty years have been found clustered around sacred sites - although a number of them have not. 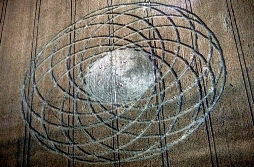 Even so, the connections between crop circles and sacred space are numerous, although I (Sig) have not found the same energies when dowsing in crop circles as I find in sacred spaces all over the world. Also, sacred spaces channel energy: I find crop circles to be more like batteries. Please recall here Sig's Hypothesis Number One: "When dowsing for intangible targets in sacred space, even if they were trained by the same teacher, it is quite probable that no two dowsers will ever find the same things". Having said that, the similarities between crop circles and sacred space are truly remarkable. Most of the following photographs are specifically of crop circles found right next to well known ancient sacred sites in Southern Britain, although several at the end that were too good to leave out were not found near obvious sacred spaces. I wish to thank Mark Fussell and Crop Circle Connector for names of the various specific crop circles. I am totally indebted to Lucy Pringle for the magnificent photographs and for her permission to use them. 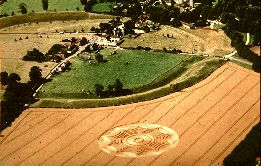 Lucy Pringle has crop circle photographs, 5 sets of postcards (2 new sets from 1997), a splendid 1998 calendar, mugs, pens etc for sale on her website. Her new Crop Circle Calendar is wonderful. Unless otherwise specified, all photographs in this MAG section are copyright, © Lucy Pringle. One final statement before the pictures begin. I have been visiting crop circles for the last twenty years and I don't have a clue how they're made, or who is making them. I honestly believe that anyone who says they know how they're made doesn't. These sacred crops are a real mystery. 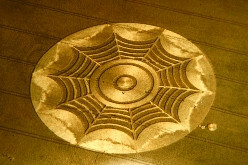 This spider's web crop circle appeared outside the henge-banks of the North East Quadrant of the Avebury stone ring. This is the largest stone ring in Europe. In the surrounding henge, the distance from the top of the bank to the bottom of the ditch was a staggering seventy feet! This photograph was taken in August 1994. Notice the ten points indicating two intersecting pentagrams. This web is quite appropriate as Avebury is a Goddess center, and Arachne can be found spinning her web in many places around Avebury. 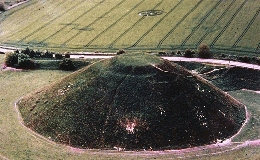 Silbury Hill is an integral part of the Avebury Megalithic complex. 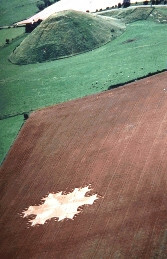 This is the largest prehistoric human made mound in Europe. Notice just above the top of its flattened cone is our next crop circle in the field just across the road. Stonehenge is, along with Avebury, one of the most prominent prehistoric sites in England. While parts of it - like the Summer Solstice Sunrise alignment with the Heel Stone - date back to the beginning of the third millennium BCE, the prominent trilithons that make the lintelled ring are relatively recent for the stone rings of Britain, coming from 1500 BCE +/-, and they perhaps served as a last hurrah for the Neolithic period. 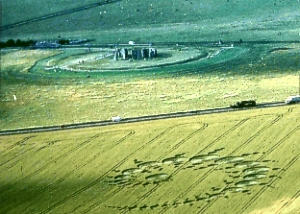 1996 was a good year for crop circles around Stonehenge as well. In July of that year the Julia Set appeared just across the main A303 road from Stonehenge. It had 212 circles in it. The person who discovered it flew over Stonehenge looking for crop circles early one morning and saw nothing in that field. When the pilot flew back over the site forty minutes later, the Julia Set was in place! So who built it unseen out there in plain sight like that? This story has become part of the crop circle mythology that has been building up in the last decade. 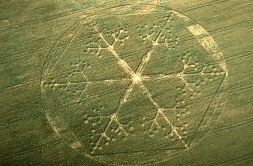 Crop circles appear with amazing regularity in the same fields year after year. 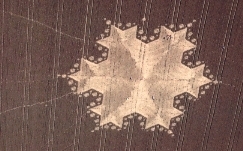 Here is an example at Stonehenge, where this snowflake pattern appeared in June 1997 in the same field as the 1996 Julia Set above. Stonehenge is the second most popular tourist attraction in Britain (after the Tower of London) and it is probably no coincidence that crop circles have been associated so frequently with this site. This intricate hexagonal figure confounds the mind when it comes to figuring out how it was constructed. I wonder if it's just a coincidence that the diameter of the enclosing circle of the Snowflake is equal to the diameter of the Trilithon circle at Stonehenge? Remember, there is twenty-four hour a day security surveillance at Stonehenge, and no one has ever seen the actual formation of any of the circles which have appeared there. 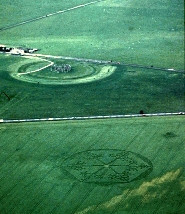 In July 1997 crop circles returned to Silbury Hill. This amazing fractal indicates the complexity that is used in the construction of these sacred crops. Notice the intricate weave of the 'lay' of the crop. This Kabbalistic symbol is unfortunately presented to us upside-down. It is called the Tree of Life, a symbol found in many countries around the world. Notice the hopscotch pattern. Many occult teachings have been handed down in children's' games. This 'bagel' made of twelve circles is remarkably three-dimensional. This shape is called a Torus. It is also the shape of a black hole and of our galaxy. 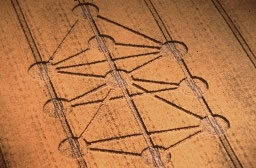 As you can tell from the dates of these crop circles, they have not been a major focus of mine recently. They certainly remain interesting phenomena; as they do not dowse the same for me as sacred space, I have side lined them for present. While some are undoubtedly built by the hand of man, I do not believe that all of them are, so they remain a mystery.